Breaking news from the field of organonickel chemistry: a stable tetraalkyl nickel compound as reported recently by a Columbia University team (Carnes et al. DOI). The highly strained dibenzocyclooctatetraene 1 with one trans alkene bond is reacted with bis(cyclooctadiene)nickel(0) (after replacing one cod ligand with a tri(tert-butyl)phosphine ligand for added stability) with some surprising results. 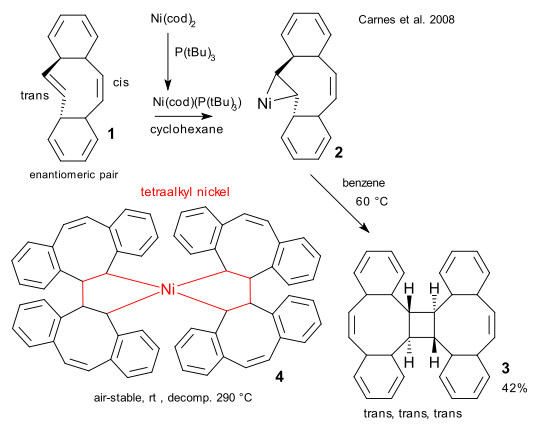 In the initial reaction product 2 nickel forms a metallacyclopropane group exclusively with the trans alkene bond. Heating this compound in benzene at 60 °C forms the trans, trans, trans cyclobutane compound 3 possibly through reductive elimination of spiro nickelaspirocyclononane 4. Indeed this compound can be isolated as air-table crystals (stable without decomposition up to 290 °C) using 1 in excess. The molecule owes its stability to steric shielding of the nickel center.